The image of the veiled Muslim woman in post-New Order Islamic cinema is caught in the geopolitical discourse of the post-9/11 era. Although she demonstrates agency, her body is prominently foregrounded in cinematic narratives and visual codes as a site for Islamic and moral issues. She embodies geopolitical discourse through the veil she wears and her Muslim femininity is defined through suffering and abuse. This chapter, however, makes a case for agency in domestic struggles, terrorism, and religious conversion displayed by the female characters discussed even though their images are produced by Muslim men in the service of debates about women and Islam. 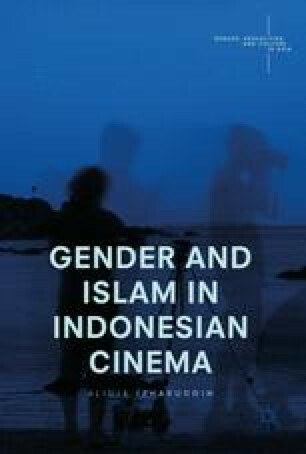 This chapter also features an analysis of the rise of Islamic film female actors which reveals the intertextual relationship between film and off-screen image that articulates a new moral cinematic aesthetic and regime of representation in post-New Order Indonesia. Friedman, Uri (2016) ‘One president’s remarkable response to terrorism,’ The Atlantic, http://www.theatlantic.com/international/archive/2016/01/joko-widodo-indonesia-terrorism/424242/. Accessed 27 May 2016. Imanjaya, Ekky (2009a) 'When love glorifies God: Islamic film is emerging as a new genre in the Indonesian film world', Inside Indonesia 97, http://www.insideindonesia.org/weekly-articles/when-love-glorifies-god, accessed 11 June 2014. Widodo, Amrih (2008) ‘Writing for God: Piety and Consumption in Popular Islam’ Inside Indonesia. 93: Aug.–Oct. Retrieved from http://insideindonesia.org/content/view/1121/29/. Accessed in February 2010. Zakaria, Raffia (2015) Women and Islamic Militancy, Dissent Magazine, https://www.dissentmagazine.org/article/why-women-choose-isis-islamic-militancy, accessed 27 May 2016.